In January 2018, I joined Doctolib as a full-stack developer, working with the feature team building the product used by doctors and secretaries in order to manage their agenda. Here is how my integration went. Every month, we have a few dozen newcomers arriving at Doctolib, working in many domains: business development, customer support, software development, product, design, human resources and so on. 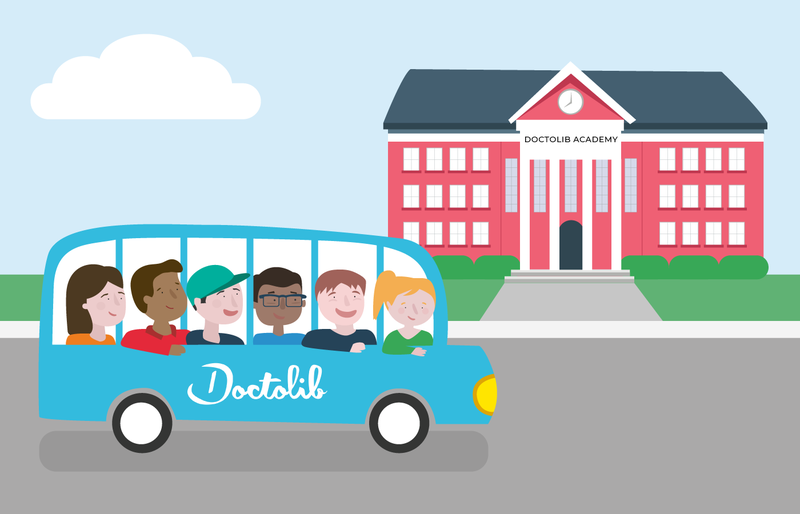 In order to best integrate all of these people into the company, and foster team spirit during the first few days, we have a process known as the Doctolib Academy, or DA. Each group attends sessions presented by other Doctolibers about the different aspects in the company. New joiners get to meet the founders, the heads of every team (sales, tech, etc.) and receive basic training on the product; this consists of several hours of discussion and presentation, and some exercises to work on in small teams. Quite academic, but also quite effective! Each person then joins their team and pursues further training, specific to that team’s work. For those joining the engineering department for instance, we have a DA Tech, where new joiners have sessions about our methodology, our stack and tools, the structure of the department, and a bit of help setting up their computers among other things! Every new joiner is also assigned a “Doctobuddy”, another Doctoliber with whom the new joiner can discuss any subject. It is always a person from a different team, often working in a different domain. After a few months, we ask some of our new joiners to write a “fresh eyes” report, to gather feedback on our integration process in order to improve upon it. Though much has changed since my first days at Doctolib, my report can still give you an idea of what you may see and feel when first arriving at Doctolib, here is mine, translated to english but faithful to the original version, and written in March 2018, 2.5 months after my arrival. I did not exactly go through the classic recruiting process. So, what I describe below may not apply to everyone. I found the overall process at Doctolib effective and very smooth. I especially liked the half-day immersion that I spent in the office working with developers from the team; it gave me a pretty good idea as to how the team is organized as well as the occasion to meet several other team members. I also had the opportunity to see real Doctolib code. All of this helped me envision what a future at Doctolib might look like. This process was an important motivation behind my decision to take the job. Since joining the company, I have been involved in the recruitment process for several other candidates. The only aspect that I think we can improve upon is the quality of the tests used during our technical interview. I have already seen twice a logic problem in an applicant code that was not detected by our automated tests. The first day was pretty nice. We arrived alongside many other newcomers where we waited together in the coffee room, enjoying the breakfast provided by the company. That was cool. I was also able to have a few words with Nico (my manager) before the DA started. The morning was a nice way to get into the swing of things. As for the DA, I found it incredible. I have never heard of any other company devoting as much time and effort to new joiners. Having the opportunity to meet our CEO, Stan, and several other prominent figures in the company during the first few days made me realize the magnitude of the investment made on newcomers, and gave me a pretty good overview of the company (although it is very sales-oriented, but I will return to that). The two weeks of DA were quite intense, especially at the beginning. A few speakers lacked a bit of captivation (In my DA, a handful of people were not listening half of the time, and asked many unnecessary questions afterwards). But overall, the experience was very positive. One thing that I particularly appreciated were the sessions about the product. The product specialists Marine and Benjamin are both very passionate about their job and the Doctolib product, and they succeeded in instilling that motivation into the group. With a platform as complex as ours it is clearly necessary for everyone to spend some “hands-on” time getting a feel for the features. On a personal note, having to develop complex features quite rapidly, I think that without those sessions, I would have wasted many hours of my fellow engineers’ time on the Doctor Team. The DA session about Medical World in France also deserves a special mention — this was fascinating, even though it took place at the very end of the first day. I think that we all feared this session after having read the title, but Cédric and Henri delivered a great presentation and they were able to make a very serious, almost tedious subject into something dynamic and interesting for all of us. On top of all that, I felt that having the opportunity to visit a doctor’s practice to see the product in use was also a very good idea. I was not expecting it before I was told, and that allowed me to learn how the product is used in real life, to give feedback about some configuration problems I noticed in the organization I was visiting, and to get into the start to find my stride. There was one minor glitch, only one of the ten people in the practice knew that I was coming and she arrived late. As for what could be improved upon, I think that it would be good for everybody (i.e. not just developers) to be presented with more Tech / Engineering information during the DA. In our group, there were a few developers and we got a good overview of what the other teams are doing. However, the others only scratched the surface of what the Dev team does during the tech session. They had many questions for us afterwards and clearly seemed interested in learning more about it. I think a session with Jessy or Ivan (The Tech co-founders), similar to the sessions from Stan and Steve, would be nice for everyone, not just the tech. As new joiners of the Tech team, we also sometimes felt that the DA was a bit too sales-oriented, particularly the Salesforce aspect. I think that it is good to know at least what it is and how we use it in order to have an overview of all the important tools used in the company, but having a hands-on workshop for several hours (without an account to work on as I won’t ever need it) was not useful. The DA Tech (A few days of sessions only for tech new joiners) clearly has room for growth. There were a few mishaps like a meeting without a booked room, or a speaker who did not show up or who was not aware of the session. I don’t know how the two DA Techs have gone since then, but I think it was due mostly to first-time mistakes, and some lack of communication between the organizers. Although a bit scattered during the week, the DA Tech was nevertheless very interesting. Some of the sessions proved slightly redundant because I had already asked the team for the same information. If everything was grouped on Monday and Tuesday, I think the process would be more efficient. When we arrive at Doctolib, the first noticeable thing is that everything seems to run smoothly. When we have a question, people have the answer or know someone who will be able to answer it. I think that this imparts a sense of the maturity of the product — both from a technical and a functional point of view. It is quite reassuring, especially when we arrive in a new team, knowing neither the people nor the stack. One small thing that I already provided feedback on is that there was an absence of information about who is who, like when I was told to go see Rom1 or Rom2 for example. A picture gallery presenting a list of teams and the members of those teams would have helped. Another thing that impressed me on arrival was the overall motivation of the teams. After leaving a company where the global vision was either nonexistent, or not shared, and where the teams were not very involved in the product, this was quite a relief. Everybody works well, seems to like their job, and are very friendly with new joiners. Under these conditions, I think that it would be very difficult to not feel welcome on arrival. Concerning the Doctor Team, the atmosphere is great, especially with the arrival of two additional new developers since I joined. There are many challenges to tackle concerning organisation due to growth or technical problems but, from what I have seen, the team is well-fitted for that. Breakfast and coffee are great. The Tech Times, All Hands and DMM are awesome. Thanks for the craft beers. The wiki is incredibly well filled and maintained. I think that the idea of having different growth tracks in the dev team is a very good way to give perspectives to everybody. It is too bad that I almost never see my Doctobuddy who is working almost all the time in the hospitals. I think the frequency of the 1 on 1 meetings with the managers is good. I was quite impressed by the deployment process and the duty guy process (even if we also have some girls that the “duty guy” term does not show ;)). Since I wrote this report, several months have passed. The DA Tech has evolved significantly and most of the mishaps have been resolved. The DA is also a little lighter than before. Otherwise, the process is still the same even if some parts had to change because the tech team almost doubled during this period. As for me, I’m still very happy that I have joined Doctolib. I’m learning new things every day and there’s no sign of that stopping — which is exactly what I was looking for when I joined the company. If this article has made you curious about the job positions we offer, please take a look at our Careers page and see for yourself! Thanks to Alexandre Ignjatovic and Alexandre Drukalski.